The arrival of the spring season brings so many amazing things with it- warmer weather, blooming wildflowers, and exciting activities! As this season draws closer and closer, those who have been cooped up all winter are overjoyed to get back outside and take advantage of this magical season. If you’re planning a spring getaway to enjoy the great outdoors, you need to visit Yosemite National Park. Yosemite in spring is truly incredible; the abundant snow starts melting away, trails and roads are reopened, and budding blooms are peeking through the ground! Take a look at what Yosemite in spring has to offer and start making your travel plans to California today! Spring is the best time of year to admire the many waterfalls of Yosemite National Park! The melting snow gives them more power and volume, creating a splendid sight you will always remember. You will also love hiking at this time of year; although the mornings are chilly (around 40 degrees Fahrenheit) the afternoons warm up to a comfortable 60 degrees. Two trails that offer stunning views in the spring include the Vernal Falls Trail and the Upper Yosemite Falls. A Yosemite spring break means there’s plenty to see during your trip! In addition to the waterfalls, you’ll also catch glimpses of California poppies, dogwood, and redbud flowers starting to bloom. The earliest flowers tend to start peeking through during the month of April. Don’t forget to bring along your camera so you can capture all these beautiful sights! In addition to hiking, there are many other spring activities to enjoy in Yosemite. The rivers are stronger than ever with the help of the melted snow, creating the perfect conditions for an exhilarating day of Yosemite whitewater rafting! You can also enjoy fishing in Yosemite and even go swimming in one of their refreshing streams or pools! No matter what you choose to do, you will love experiencing Yosemite in spring. Whether you’re visiting Yosemite in May or October, you’ll always find wonderful things to do here! Make the most of your trip by staying in the best accommodations possible. 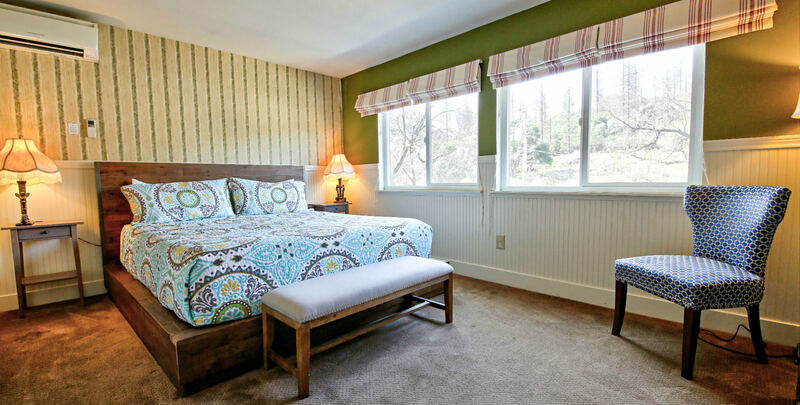 Hotel Charlotte is a historic bed and breakfast in Groveland, California, located at the gateway of Yosemite National Park, that offers luxurious lodging and outstanding amenities. Choose from staying in one of our twelve lovely rooms or renting one of our cozy apartment rentals. You can explore the many attractions of our surrounding town of Groveland, adventure through the magnificent Yosemite National Park, or simply spend time in our peaceful environment. We have a beautiful living room, friendly and helpful staff, and even our very own Fork and Love Restaurant to accommodate all of your needs! Don’t wait another minute to start planning your dream vacation; check our availability and book your stay today! Download our free Vacation Guide today! This is your ultimate resource for discovering the many things to do in Groveland, CA, and Yosemite National Park!